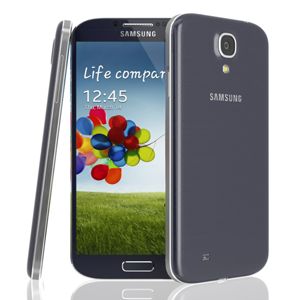 The Galaxy S 4 is Samsung's flagship device for 2013. The S 4 ups the ante of its predecessor thanks to a 5" 1080p Super AMOLED display (PenTile 441 ppi), a pseudo octa-core Samsung Exynos 5410 or quad-core Qualcomm Snapdragon 600 (depending on region), 2 gigs of RAM, up to 64 gigs of storage, LTE connectivity, and a 2600 mAh battery. Furthermore, the device features additional features such as floating touch and a 13 MP shooter featuring a revamped camera interface. All this brute force is encased in 7.9 mm of Samsung's well known Hyperglaze plastic finish.